Top spot for the best laptop for music production has long been dominated by the Apple Macbook Pro. As the only platform for Logic Pro X, the Macbook is ubiquitous within all walks of music production, be that in the DJ booth, on the road and from home studios to pro setups. PC users have usually been confined to the humble old desktop format, but the times they are a-changin’ and have. With the rise of the ultrabook and gaming laptops, Apple’s stranglehold on the world of music production, mobile, or otherwise, is at an end. The Cupertino-based firm is now trading punches with Microsoft, Dell, Samsung, MSI, Asus, Acer, Lenovo and even Huawei. When shopping for your next big-budget music production laptop, you’ll need to be focussing much of your attention on power. Although, the basic specification requirements for most DAWs is a multi-core processor, around 3GB of RAM and a few gigabytes of storage, many producers and DJs will also be running photo and video editing software too. Therefore a machine capable of handling the latest software is required. Another feature high on a DJ’s, or travelling musician’s list is weight - the lighter the better. Combined with that that other must-have; good battery capacity and we quickly see the price for a good all-round laptop reach premium levels. So in this roundup we will be concentrating our search on the best laptops that are available in the world today, so you can be sure that your future-proofing yourself for the longest time possible. We won’t be focussing on various legacy ins and outs, such as the number of USB sockets, or lack of, for your audio interface etc. With vast swathes of USB hub and docking options available, your hunger for I/O can be sated in such dongles and peripherals. If you're after the latest and greatest laptop from Apple, we suggest you look into the 2018 model of the 13-inch Macbook Pro with Touch Bar. While Microsoft had the performance edge over last year's MacBook Pro, with the Surface Book 2, Apple has come out swinging with some seriously beefed up specs for the 13-inch MacBook Pro 2018, and even more so if you go for the larger 15-inch model. The headline Touch Bar – a thin OLED display at the top of the keyboard can be used for any number of things, most notably the features within Logic Pro X 10.3. It's certainly retained Apple's sense of style, but it comes at a cost. This is a pricey machine, so you may want to consider one of the Windows alternatives. If you're open to switching to a PC, definitely consider the XPS 13 or the excellent MateBook X Pro. But, if you're a steadfast Apple diehard, this is definitely the best laptop for you! The Huawei MateBook X Pro is our pick for the best laptop money can buy in 2018. 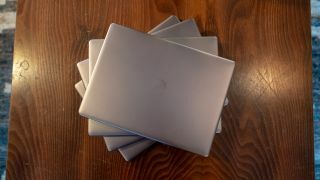 After years of this list being dominated by the (still excellent) Dell XPS 13, the MateBook X Pro has proved to be a truly brilliant challenger. This is a gorgeously-designed laptop with a stunning screen (albeit with a rather odd aspect ratio), and it comes packed with cutting edge components that allows it to perform brilliantly, and a battery life that runs rings around many of its rivals. It also has a very competitive price, giving you features, design and performance for quite a bit less money. Sadly, it's not available in many countries, so if you struggle to grab hold of it, look into getting the Dell XPS 13 (below). Even though the Dell XPS 13 has been knocked into second place by the sublime MateBook Pro X, it’s still an absolutely brilliant laptop. There’s a good reason why it was at the top of our best laptops list for three years running. The 2018 Dell XPS 13 is a slimmer, more powerful version of the award-winning laptop with a stunning 4K display and a gorgeous Rose Gold on Alpine White colour option. The Dell XPS 13 rocks an 8th-generation Intel Core i5 or i7 processor and a bezel-less ‘Infinity Edge’ display, this Dell XPS 13 continues to be the most popular Windows laptop in the world. What’s more, there’s a wide range of customisation options, so you can really make the Dell XPS 13 the best laptop for your needs. Microsoft's second attempt at a pure laptop device is an absolute winner in our view, and while it doesn't represent a huge overhaul of the original Surface Laptop, it offers improvements in all the areas we were hoping for, including updated hardware that brings serious performance benefits. This is a laptop that finally delivers on what Microsoft set out to do with the original: a pure, powerful Windows 10 laptop experience. If you're not sold on the 2-in-1 nature of the Surface Book 2, but love Microsoft's premium build quality and design, then the Surface Laptop 2 is the laptop for you. A very worth addition to this list. The Asus ROG Zephyrus S GX701 is the best gaming laptop of 2019 thanks to its powerful components that include a 6-core Intel processor, and the latest RTX 2080 graphics from Nvidia. Not only is this a brilliant performer, but it's also impressively thin and light as well (by gaming laptop standards). Asus' Zephyrus laptops have constantly pushed the boundaries of what gaming laptops can do, and this new model for 2019 is no different, which is why it has made it straight onto our best laptops list. It's available to pre-order now, but be warned: this is a very expensive laptop. If you're looking for something a bit more affordable, check out the Acer Predator Helios 300 below. The Acer Predator Helios 300 is a fantastic affordable gaming laptop that proves that even if you don't have the kind of money to buy the MSI GS65 Stealth that also features on this best laptops list, you don't have to sacrifice too much when it comes to power. The Acer Predator Helios 300 packs some excellent components, such as a new 8th generation 6-core Intel Core i7 processor, Nvidia GTX 1060 graphics card and 16GB of RAM. While it's still an expensive proposition compared to regular laptops, for a gaming notebook you are getting a heck of a lot of power for the price. While it may not have the best keyboard in the world, the Samsung Notebook 9 is still one of the best laptops you can buy in 2018. Packed with more horsepower than the MacBook Pro, but at a much lower price, Samsung has crafted a laptop that has just as much substance as it does style. Plus, on top of its killer specs, it’s lightweight and thin, making this one of the most portable 15-inch laptops you can buy today. Last year's iteration of the MacBook is another win for Apple, and it's once again won us over with a gorgeous design, excellent performance and best-in-class battery life. Apple has updated the processors with Intel's 7th-generation Kaby Lake range, which means you get improved performance and longer battery life without sacrificing the thin and light design that the MacBook is famous for. While the MacBook 2017 is not designed as a pure productivity machine, like the more powerful and versatile MacBook Pro above, or as a gaming machine like the Asus ROG Zephyrus GX501, it's still one of the best laptops in the world right now thanks to being a super slim and light MacBook that you can take anywhere without even noticing the weight, and being a powerful showcase for macOS High Sierra. If you're after a MacBook, this year's model is easily one of the best. Asus has struck gold with its new refresh of its ZenBook Flip S 2-in-1 laptop, with the Asus ZenBook Flip S UX370 impressing us so much it's landed straight at number 3 in our best laptops list. With a new Kaby Lake R 8th-generation processor powering the device, plenty of RAM and a super-fast PCIe SSD in certain models, this is an absolutely stunning laptop. Its 2-in-1 design means you can use it as both a laptop and a tablet, and while it's not as affordable as some machines on this list, if you have the budget you'll be really happy with this fantastic device.